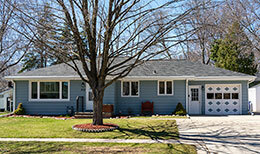 It’s March 2016 and the Green Bay housing market is hot for sellers. Housing inventory is down, mortgage rates are low, and it’s been quite mild weather wise. Don’t believe me? Ask some of my buyers who have placed offers ABOVE ASKING PRICE only to get outbid by another buyer. But just because it’s a hot hot time for sellers doesn’t mean any home will sell fast. Remove wall paper and add relaxing neutral paint instead. Taking down wall paper is annoying you say? Ahhh, well, buyers say the same thing! And trust me, they think of it in terms of money taken off the purchase price. Clean your front door and the entrance. Buyers agents bring people through the front door, make sure it’s clean of spider webs, trash, sticky door handles… You get the idea. Work on minor repairs/updates in your kitchen and bathroom. Those two rooms are where you will get the most bang for your buck. Maybe it’s simply changing out hard wear or putting up new light fixtures to brighten (brighten, ha!) up the space. It would be the best bet to contact a Realtor who will walk with you through your home, room to room, and tell you about other areas which might need some attention. And don’t feel like you’ll be bugging your agent, remember they are working for you. They should earn your business! Contact Green Bay Realtor Elysia Diaz!